As promised yesterday here is the footage from Lexus showing their LFA Nürburgring package lapping the Nordschleife in 7 minutes 14.64 seconds. Forget the semantics of claiming records for one moment and 7:14 is just plain fast. No other way to describe it, really. Lexus also say the LFA Nürburgring used to set the time was not modified in any way and even ran on the standard Bridgestone Potenza RE070 tyres it is delivered with. The special edition model has improved downforce over the regular LFA and also has slightly more power; up from 412kW to 420kW. Just 50 will be made, leaving 450 standard LFAs in the total production run of 500 cars. The time is no doubt a bitter sweet moment for the Lexus family after they lost respected test driver Hiromu Naruse at the wheel of an LFA Nürburgring development model in Germany last year. The 67-year-old was involved in a head on collision with a BMW test vehicle on a public road near the Nürburgring. Naruse was known as the “Godfather of the LFA”. You can watch the full onboard video of the 7:14 lap after the break, as well as an official statement from Lexus. Lexus has set the fastest ever recorded lap time for a road-registered series production car around Germany’s infamous Nürburgring circuit – better known as “Green Hell”. 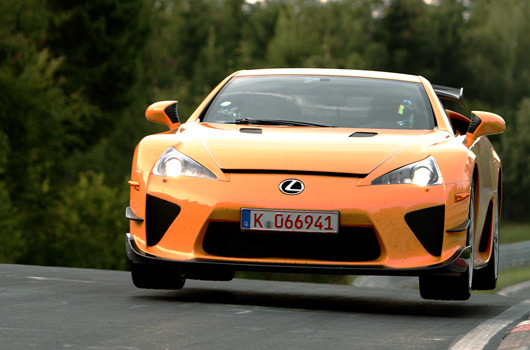 The soon-to-enter-production Nürburgring Edition LFA supercar sprinted around the 22km circuit in 7 minutes 14.64 seconds. Driven by Japanese test driver Akira Iida, the LFA featured no modifications over the production model and used Bridgestone Potenza RE070 tyres as fitted to the standard road-going LFA. 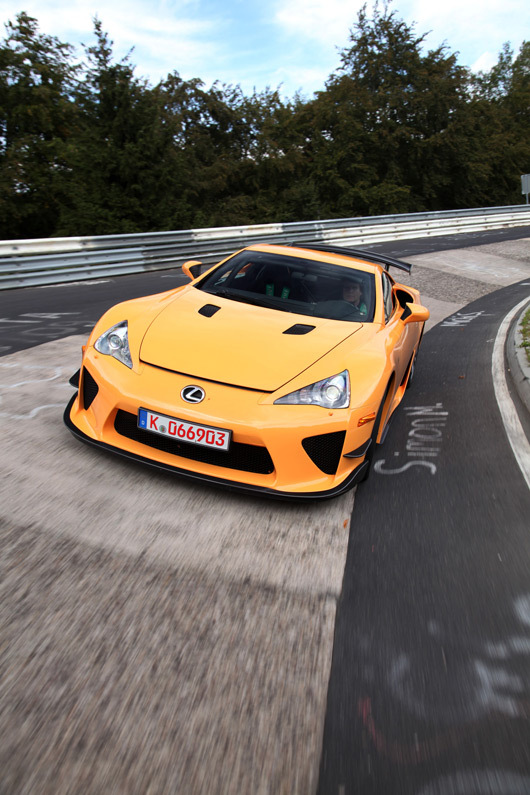 The LFA Nürburgring package has been optimised to deliver higher performance on the track, with a number of modifications made to the standard LFA. The LFA Nürburgring package is included in the limited 500 production run of the LFA. It includes a carbon fibre reinforced plastic (CFRP) front spoiler and fixed rear wing to enhance aerodynamic performance. The LFA Nürburgring package also comes with track-tuned suspension and custom wheels to improve manoeuvrability and stability. Compared to the standard LFA’s output of 412kW (560 PS), the output of the LFA Nürburgring package has been raised to 420kW (571 PS) to counter the slightly increased drag coefficient from its unique aero downforce package. ‘For us, it is always very special when a car is developed to meet the needs of the Nürburgring-Nordschleife,” said Dr Schmidt, COO of the Nürburgring Automotive GmbH. “It shows us that the Nordschleife is still of particular importance for the automotive industry and that it still radiates a tremendous fascination. “The lap time driven demonstrates impressively that Lexus has done an excellent job in matching the challenges of the track with the needs of an exclusive sports car,” Dr Schmidt said. “Since 2004 in the spring and summer of every year we have conducted development tests for the LFA at Nürburgring Nordschleife,” said Haruhiko Tanahashi, LFA chief engineer. “The development team’s obsession, Iida-san’s concentration and good course conditions all led to achieving this record,” said Mr Tanahashi. The Lexus LFA supercar was first shown at the 41st Tokyo Motorshow. The final development of the carbon fibre chassis for LFA took place over five years, which followed a five year research program into alloy bodies. The entire program was an indispensable step for Lexus, and its future models. The first model of the new generation Lexus, the new GS, shows the future direction for the brand in terms of bold, dynamic styling, precise handling and innovative technology. The full hybrid GS 450h will be shown for the first time at Frankfurt Motorshow on 13 September.